Ever since his 3-year training at Newark & Sherwood College (1977-1980), Ben has worked almost exclusively on pianos (also harpsichords & early pianos) used by demanding professional musicians. 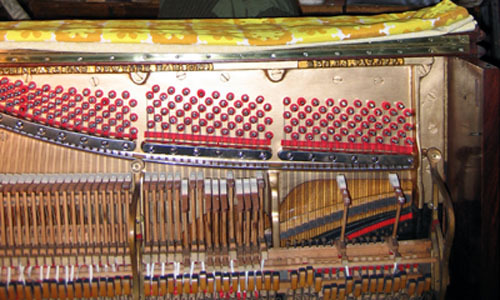 Ben has long established himself as an expert in restoring professional instruments in situ to peak performing condition. This usually requires 1-5 days’ work, involving repairs, fine regulation, re-shaping of hammers, voicing and tuning. He was Steinway & Sons European Concert Technician (1980-1985), based at the factory in Hamburg, Germany. There he built pianos (mainly grands) and travelled extensively to service, restore, or prepare them for recording sessions. As a member of the elite Voicing department, Ben received training unrivalled anywhere in the world. He went on to train others. Privileged work, indeed! Then head-hunted by Mattson & McGehee Pianos in Denmark, Ben was their chief piano technician for 3 years (1985-1988), helping to establish Fazioli pianos in Scandinavia, and advising on construction and training at the small Egtved piano factory. 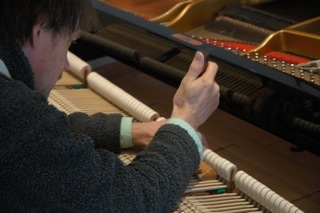 Returning to the UK in 1988, and basing himself at his small workshop in Sussex, Ben has remained an independent and international consultant piano technician. He also works as a musician, teacher and performance storyteller, using his Equity stage name Ben Fairlight.